Vancouver, BC – An exclusive new video published to YouTube on September 17, 2015, catches up with night vision videographer Tom Sanger to discuss his evidence of a UFO over the Santa Catalina Mountains near Tucson recorded on Independence Day. 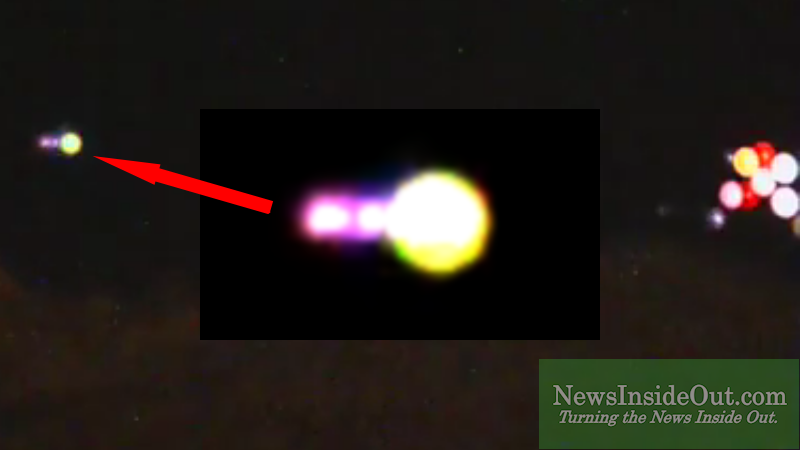 Fireworks weren’t the only bright objects in Arizona skies that July 4, 2015, evening as the seasoned experiencer and his sky watch colleague teamed up to capture one of this summer’s most talked-about close encounters. While MUFON has declared the matter “case closed” a few questions remained concerning optics that even the so-called professionals of UFOlogy may be loath to consider. Citing communications masts visible on Mt. 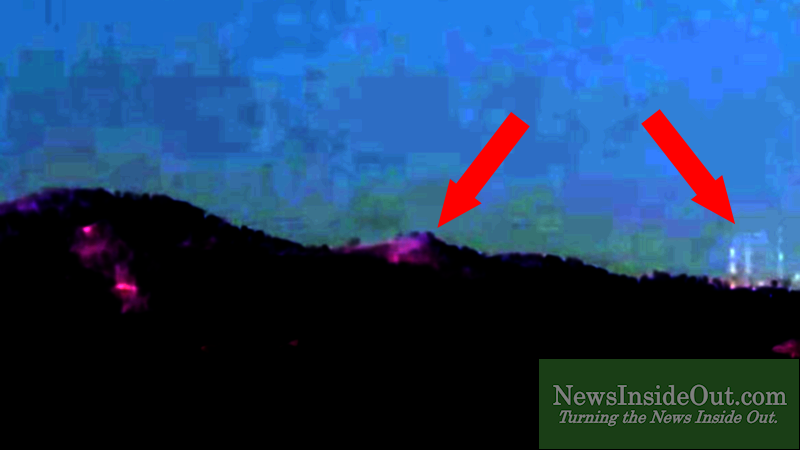 Bigelow, Open Minds stated on July 22, 2015, that “out of focus lights can be seen on the far right of the screen” at the beginning of the video. This defocused status contrasts with a pin-sharp in-focus recording of the UFO, indicating how the mystery object and communications masts resided on two entirely different focal planes that evening. During his NewsInsideOut.com interview, Tom Sanger emphasized that while recording fireworks that evening he had manually set focus at that time for nearby, not distant objects, recanting earlier remarks to Open Minds in which he described an object at 30 miles distance. Huffington Post’s follow-up from earlier this month offered the report of Phoenix MUFON’s director of investigations whose on-site post-event survey determined that human activity (described by HuffPo as headlights from automobiles) near the summit of Mt. Bigelow was the cause behind the sighting. A gated roadway leading to a platform does exist at relative line-of-sight to the camera’s perspective, but according to the witness, this is no superhighway trafficked by a lineup of hundreds of vehicles passing through the trees over the 8 plus minutes accounted for in the video. The strong possibility exists, supported by optical evidence, that the UFO was in fact located over Sanbino Canyon between the mountain and the observer. During his NewsInsideOut.com interview Tom Sanger described how the masts and peak of Mt. Bigelow both resolve along the same focal plane when imaged during daylight with the Luna Optics camera. That the UFO resided upon a separate focal plane at variance with the distance to out-of-focus communications masts shown in the early frames of the video is abundantly clear to all parties concerned. In this reporter’s considered opinion, the evidence shows that the UFO was not on the mountain. It was recorded hovering in the foreground. Digital magnification of the Tom Sanger UFO reveals possible structural details including three individual light sources separated by discrete gaps along the observer-facing portion of the object’s airframe. 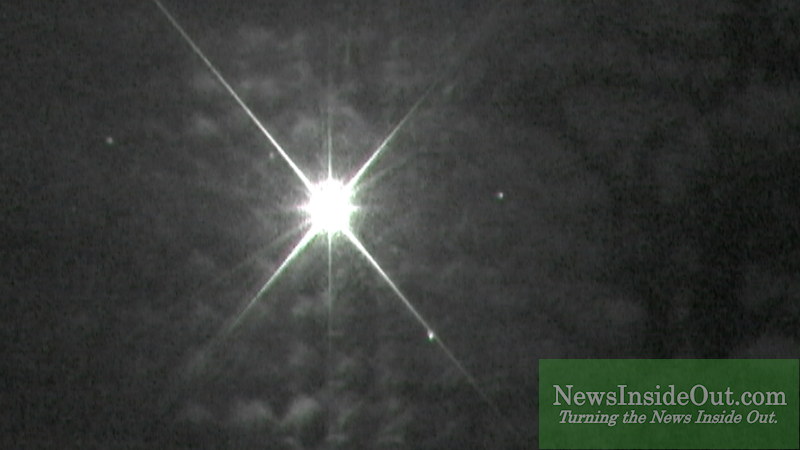 The relationship between exceptionally bright bursts of light shown in the video and the operations of hand-held illuminators is further explored during the NewsInsideOut.com interview. The impact of a one Watt laser recorded at 13 miles distance on a 0 Lux broadcast camera’s sensor array is compared to overexposure suffered by the 0.03 Lux Luna Optics LN-DM50-HRSD when capturing fireworks. Lights from the UFO neither display streaming trails from sweeping hand-held light beams nor do they at any time overexpose on the sensor. Archival footage from Mt. Adams in Washington provides a baseline for evaluating such claims, suggesting how the 300-times-more-sensitive Luna Optics camera would have struggled to display anything other than a whited-out image frame under similar conditions near Mt. Bigelow. The Tom Sanger video shows no evidence of the visual jitter associated with hand-held lights and their operations. It is as if the UFO lights were performing with machine-like precision at a separate focal plane from the summit. Was it hundreds of dancers wearing headlamps rotating in a circle on the Mt. Bigelow platform? The focal plane evidence again denies such suggestions. What really happened is that members of the public equipped with affordable night vision optics exceeded the data collection performance of so-called UFOlogy experts who proceeded to attempt to bury the story under a mountain of spurious claims and paperwork. Their loud and widespread protestations betray serious absence of real-time instrumental field operational experience and post-event critical analytic skills. The Tom Sanger video and its public consequences offer a revelation concerning how persons seeking answers to UFO contact mysteries are today empowered in pioneering independent avenues of research at these awe-inspiring frontiers of twenty-first century knowledge. To paraphrase a line from Bad Boys II (2003), the Tom Sanger Independence Day UFO “just got real.” Readers can watch an exclusive NewsInsideOut.com enhanced version of the UFO below.